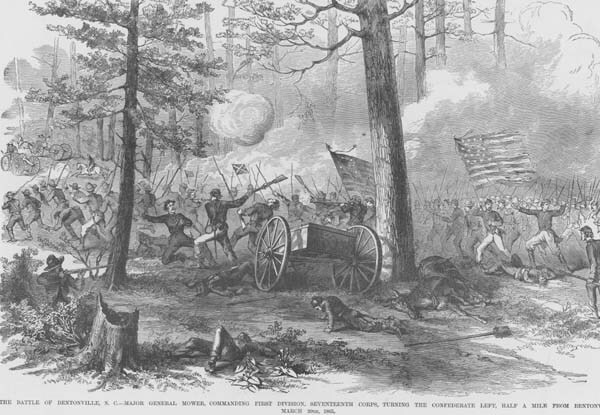 The Battle of Bentonville was the last full-scale action of the Civil War and the largest ever fought in North Carolina. Bentonville was the only major attempt to defeat the Union army as it marched through the Carolinas, led by Gen. William T. Sherman. This North Carolina's historic landmarks website contains maps, the order of battle, chronology and synopsis of the Battle of Bentonville. The Battle of Bentonville, fought March 19-21, 1865, was the last full-scale action of the Civil War in which a Confederate army was able to mount a tactical offensive. A history of the staff ride with an outline explaining how to organize and lead a staff ride at any level. By William Glenn Robertson. Center of Military History, United States Army, Washington DC, 1987. The Battle of Bentonville, N.C.
turning the Confederate left half a mile from Bentonville, March 20th, 1865.